Global dust storms are a recurring phenomenon on Mars, and happen regularly about the planet regardless of season. Every 3-4 Martian years (6-8 Earth years) one of these smaller storms grows rapidly and becomes a global storm, blotting out the Sun from Mars’s surface and obscuring surface features normally seen from Earth. In the movie The Martian, astronauts are caught in a devastating dust storm that blocks their vision, pelts them with particles, and sends them flying away. 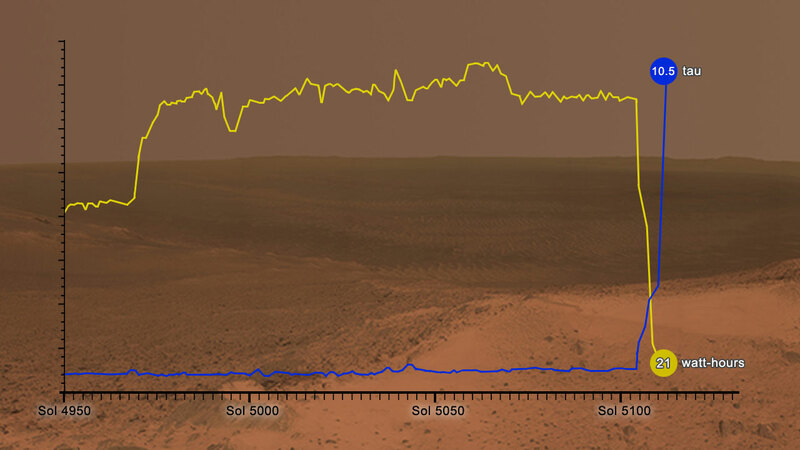 A real Martian dust storm is much more tame, however, as the atmosphere is so thin, wind just doesn’t have the moving power of wind on Earth, and wouldn’t be enough to push a rover or a person. In fact, this latest dust storm is much more of an opportunity than a hindrance. Scientists have been expecting a new global storm, and with more spacecraft operating in orbit of Mars than at any other time in history, it’s a chance for us to study this type of climate event in more detail than ever before. This is exactly what has been happening over the past five weeks. 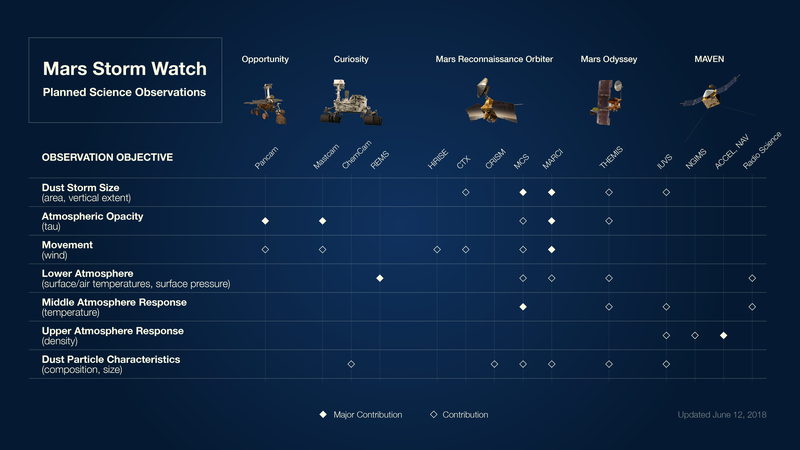 As you can see from the above image, the Mars Reconnaissance Orbiter (MRO) plays a special role. MRO is similar to an orbiting weather satellite on Earth, able to image the entire planet’s surface daily, tracking the development of the storm and allowing the rover teams to have an early warning of the problems to come. Mars Odyssey and MAVEN also have useful roles, studying the response of the lower and upper atmosphere to the storm, looking at how high the dust goes, if it is indeed lost to space, and how it shifts around the planet. This data will help scientists understand how and why these large storms develop, and may even allow us to predict their formation in the future, similar to weather predictions here on Earth. What about the rovers? On the ground, the dust is thick enough to obscure the sunlight and potentially cause damage to electronics. Really this is only a problem for the solar-powered Opportunity rover, while Curiosity can still operate due to it’s nuclear battery. Both rovers can measure a quantity called ‘Tau,’ a measure of the opacity of the atmosphere. Naturally Tau is inversely proportional to the amount of energy Opportunity’s solar panels can generate. As you can see, it has become dark on Mars, and Opportunity’s last contact was on June 10th, 2018, likely due to a low power fault. When this happens the rovers is programmed to go to sleep to protect instruments, and will wake up when the skies clear, the Tau drops, and power flows again. Every day the mission team listens for a signal from Opportunity, but it likely won’t come until the storm ends sometime in the coming weeks or months. In the mean time, on the other side of the planet, the Curiosity rover is working on an analysis of rock samples from it’s latest drilling operation, while monitoring the storm to see how conditions on the ground are changing. Here on Earth, it’s a great chance for amateur and professional astronomers alike to view the red planet and photograph the planet wide storm, especially since Mars is at opposition. This is where Mars and Earth are close together in their orbits, with Earth coming in between Mars and the Sun. Even though the dust obscures surface features, the storm itself is an amazing feature visible from Earth. If you have a telescope powerful enough, go take a look and snap a photo. For the time being, the storm is still in full swing, and orbiters and rovers are gathering all the data they can to help with our understanding of Martian weather. Hopefully when the dust settles, Opportunity will wake up and continue on its way, weathering the storm without sacrificing itself. It survived the last one in 2007, can it survive once more? Only time will tell.